You can subtitute chicken or shrimp in this recipe. Serve with basmati rice or garlic naan. 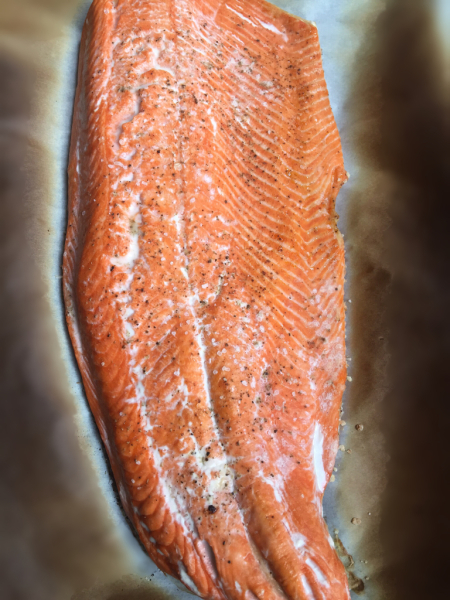 Place salmon fillet on parchment paper on a sheet pan. Sprinkle fish with salt and pepper. Broil salmon in the oven @ 400 degrees (middle rack) for 10-15 minutes until top is browned and fish is almost cooked thru. Keep an eye on your oven that you don't burn the salmon since it's on broil. Once done remove and let cool. Meantime, heat the oil in a large skillet over medium heat, add cumin seeds and fenugreek seeds and cook 1 minute. Add garlic, ginger and chilies and cook 3-4 minutes. Add tomato paste and cook for another 2 minutes. Add salt, masala and tumeric, cook for 2 minutes. Add chick pea water, crushed tomatoes and plain yogurt to the pan and whisk until combined. Cut cooled salmon into 2 inch chunks and add to the sauce and cook 5-10 minutes.